From top left across: 1.LoveandPeas , 2. Just Jax, 3. Gumnut Logic, 4. Carola Bartz, 5. Dana Barbieri, 6. Kristin Dudish, 7. BostinStuff, 8. Jamie Barks, 9. Regina Lord , 10. JustMelanieJune, 11. CreativeBeast, 12. BeckyV. When I set the Lavender Purple challenge, I wasn’t sure how this would pan out this week as this color really did scare me a little, but I have to say i think this was the most fun week. Maybe because we could add the other colors if we wanted with that little extra freedom or perhaps because i was in the swing of creating as part of this challenge. I hope you all enjoyed your final week as much as I did. Please check out the rest of the fabulous entries in the flick group here. Here’s my final entry. Mixed Media on 8×8 stretched canvas. i used collage papers, ribbon, buttons, pen, plaster. Really loved making this piece. I incorporated all the challenge colors except for Raspberry red! The scan is a little blurry because of the raised objects. So yes this is it! The Creative Color Challenge is over for August. I will be posting a final wrap up in the form of a little screenshow movie tomorrow night which will also be posted on youtube, so I hope everyone is okay with me including one or many of your creations to showcase what a great experience this has been. (if you do not want to be included for some reason, thats okay just email me asap). Everyone who has participated will be credited in the movie. Ill also be announcing the randomly selected participant who wins a little colorful goody for taking part on tomorrow nights post. This weeks color was a challenge, but it ended up being one of my favorite art pieces I've made, so thank you! thank you so much for hosting this Louise, it has been fun and i am so inspired by all the wonderful creations. Louise, I absolutely love your piece! Just like you, I was scared of purple at first, but then I had so much fun as well!! Thank you for hosting this challenge, thanks to you I've found back to creating on a more regular scale. I've enjoyed this so very much! Thanks so much for the inspiration–and for “challenging” us to paint in different colors we may not always use… I'm not really a purple person but I love how my girl came out. So much FUN to look at all of the great art, different mediums in the same color and to see other people's interpretation of it! Great job Louise and thanks for connecting all of us in such a creative/art way! Your art is lovely. OMG! I can't believe you posted my flower for this weeks wrap up! I feel truly honored to have had my work posted in TWO wrap-ups for this challenge, especially since I felt my flower was such a simple thing…. 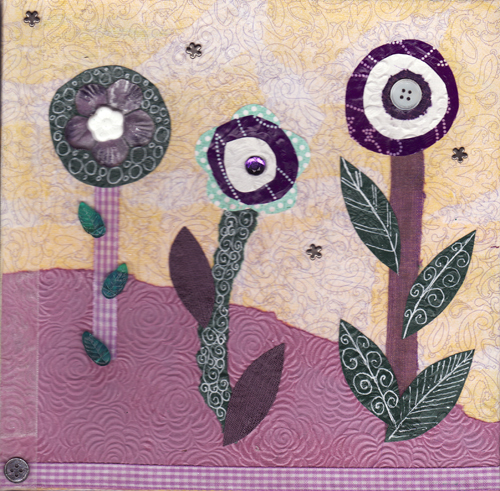 Louise, your final piece looks wonderful – so fun and playful! Will it be up for sale at your etsy shop? 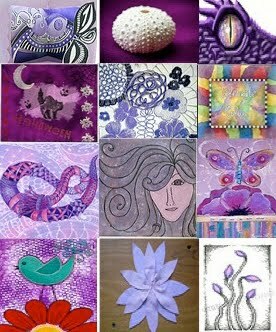 love all this purply goodness….it makes me smile!!! Louise, you are the Color Challenge Queen! Your art is beautiful and thoughtful, and your idea to have this challenge was inspiring. I'm so glad I participated, even if a few pieces were hurried. The main part was I did it and it brought me back to why practice of anything you love is important. And to see what others are doing out in the big world was fun!! So much talent. ps…I switched to Stephanie's class! Woo hoo!! Loiuse, this idea was brlliant. I couldn't maka all entries but I had so much fun for the two I sent. I will definetedly participate agai in any challenge you work. Thank you so much for the energy and dfreams shared! You sure are Enjoying the Ride!